The Farthing was a small British coin that was worth one-quarter of an old penny – 1/960th of a Pound. It’s name derives from the Anglo-Saxon feorthing or fourthling, meaning fourth part. It was last minted in 1956. Farthings were minted as early as the 13th century under the reign of Edward I, although they may have been minted earlier under Henry III. Early examples are rare. These were small silver coins but they competed with ‘cut-coinage’ where a penny would be literally cut into four and used as a quarter of a penny. 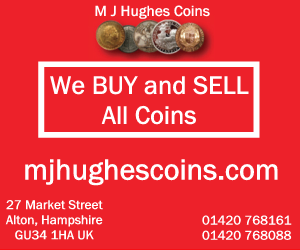 Farthing were minted in silver, copper and tin. After the Act of the Union in 1707 (which unified England and Scotland), copper farthings were minted on a more regular basis. In 1799 Matthew Boulton started producing farthings in his steam-powered Birmingham factory (famous for making the cartwheel penny and twopence). 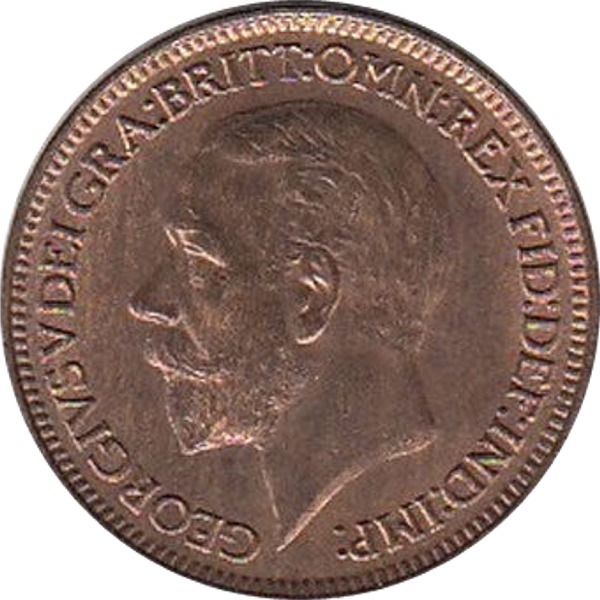 The reverse was marked ‘1 FARTHING’ which was the first time a denomination had ever appeared on a British or English coin. It was also the first coin to have the date on the same side as the Monarch. Boulton made another batch in 1806 and the Royal Mint took over in 1821. 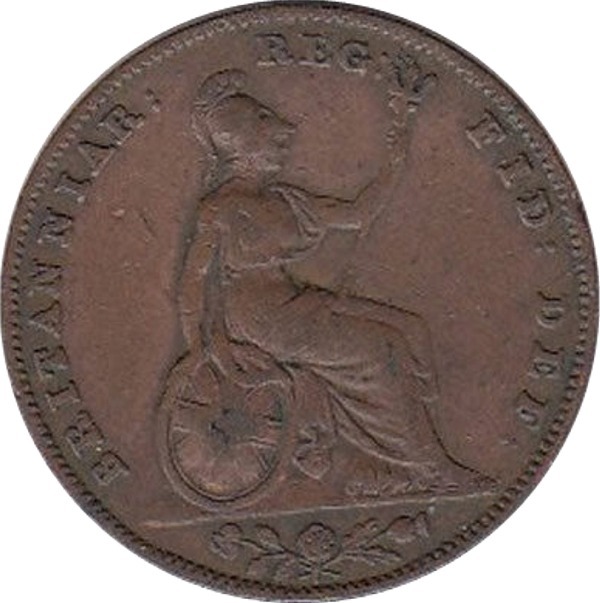 Farthing were made under George IV and William IV and the design was generally that of a small version of a penny, with Britannia on the reverse. Farthings were minted in most of the years of Victoria’s reign. 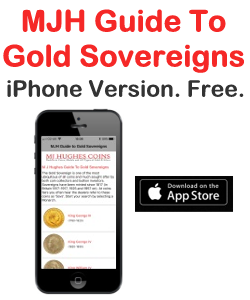 The same obverse dies were used for the copper farthing and the sovereign and probably were used for the gold coin first. Victoria was the only monarch to have two obverses: a ‘Bun’ head and the Old or ‘Veiled’ head. By 1860, the government decided to switch from copper to alloys so as to improve the quality of the coinage. Pennies, halfpennies and farthings were struck in bronze, both in Birmingham and at the Royal Mint. Bronze is 95% copper, 4% tin and 1% zinc and this was used with only minor changes until the end of the farthing in 1956. Farthings continued to be minted almost every year and the design was the same as the penny (with Britannia on the reverse). There was a pattern design for the Edward VIII farthing in 1936 but none were actually made in production. 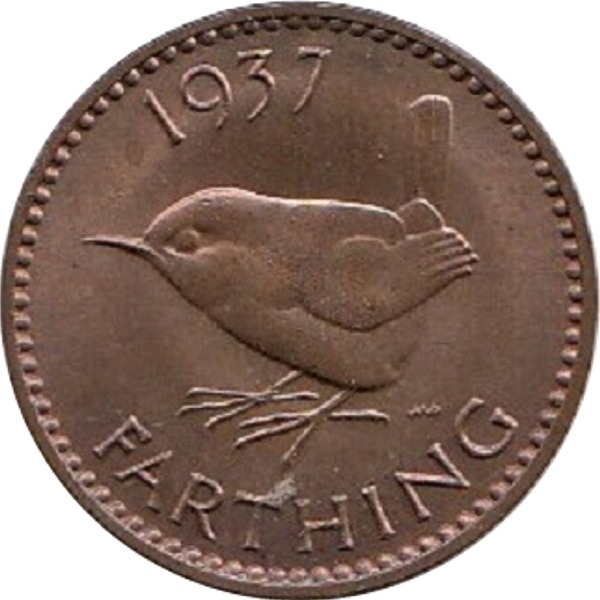 In 1937 the farthing at long last got it’s own unique reverse: a wren, designed by artist Harold Wilson Parker. 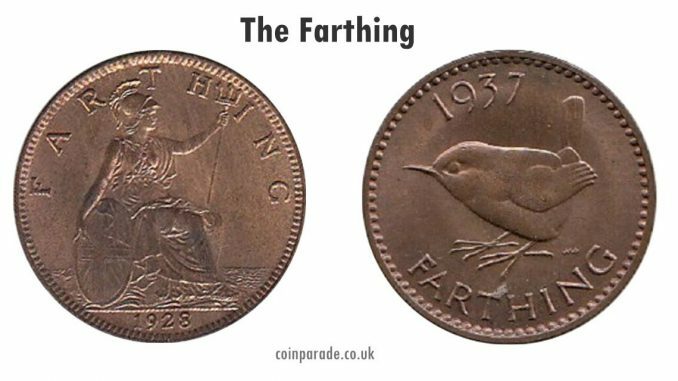 By the 1950’s inflation had eroded the spending power of the farthing (which was just 1/960th of a Pound) and with it the support of the public. Production was discontinued after 1956 and the coin ceased to be legal tender after 31st December 1960.